Twists Glass Studio have been showing Jacobite style air-twist, cotton-twist and colour-twist glasses at the Spring Fair Birmingham for the past 20 years. Twists Glass Studio made the air-twist goblets as seen on the TV series Outlander as seen in Season 2, Episode 3. Technically, to actually be classed as Jacobite, the glasses have to be engraved with symbols that showed loyalty for the “cause”. These made the glass decorative without giving away their secret, as it was death for anyone sympathetic to the Jacobite rebellion. The air-twist has always been called “Jacobite” glass as its invention coincided with the rebellion of 1745. Mike’s air-twists are hand-finished in the same way as they would have in the 18th Century, and are all made in Scotland at his studio. 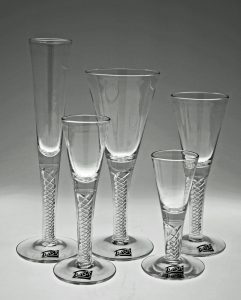 So experience the feel of the past with our range of Georgian style twisted stemmed drinking glasses, made in 24% lead crystal. The soft rounded rim can only be formed with great heat as the bowl of each glass is skilfully hand opened and finished at the furnace. 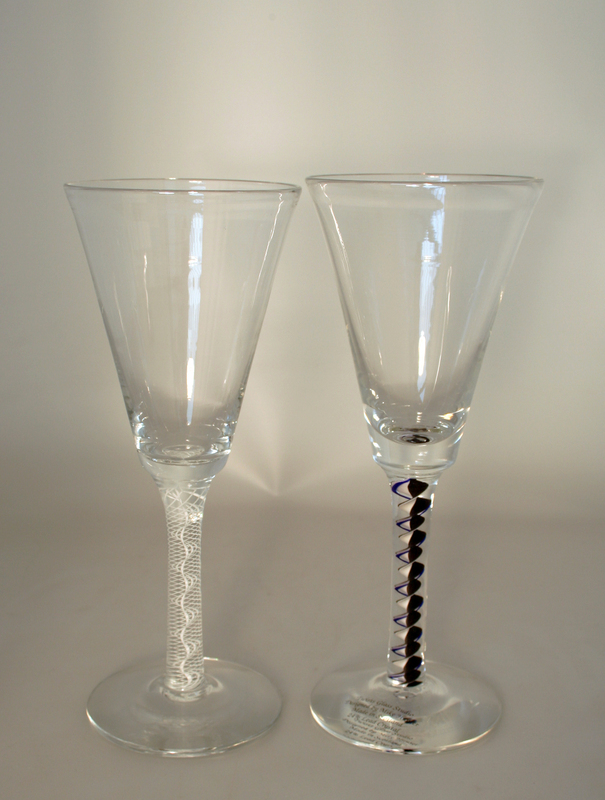 Air twist glasses in red wine, white wine, champagne. port and whisky tot. Cotton twists and colour twists also available.